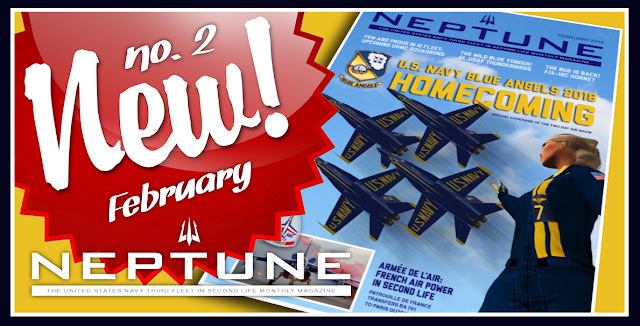 NEPTUNE No.2 in a news stand near you! 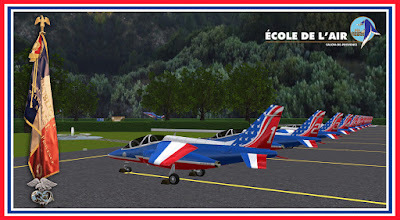 EPAA 20.300/312 (Equipe de Présentation de l'Armée de l'Air 20.300 et 20.312) aka the Patrouille de France in Second Life is the Armée de l'Air ambassador squadron and together with training squadron GE 314 (Groupement-École 314 "Christian Martel") share BA 701 as their home. 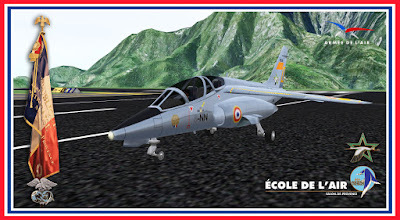 Recently, the squadrons were relocated near Paris and got a small overseas base with open skies practice characteristics at Gordon Regional Airport in the small Sharp Continent. 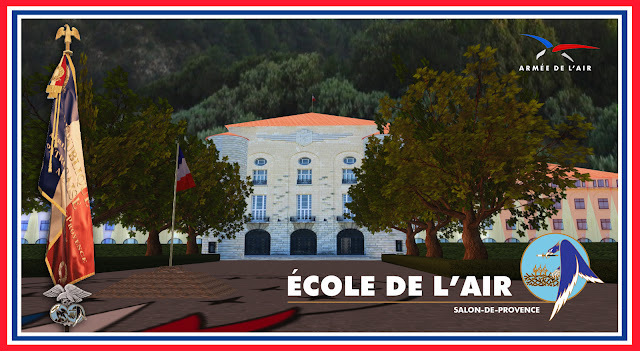 Base Aeriénne 701 Salon-De-Provence is now, in Second Life, located very near Paris! The layout is exactly the same as it was for the last years and in one region manages to recreate the atmosphere of the real life BA 710: the academy building, the hangars, the gardens, the tarmac and runway... all the elements found in the real life air base and school are present and, in a nutshell, remind us of it in a very clever and emotional way. A reference in Second Life's aviation history. 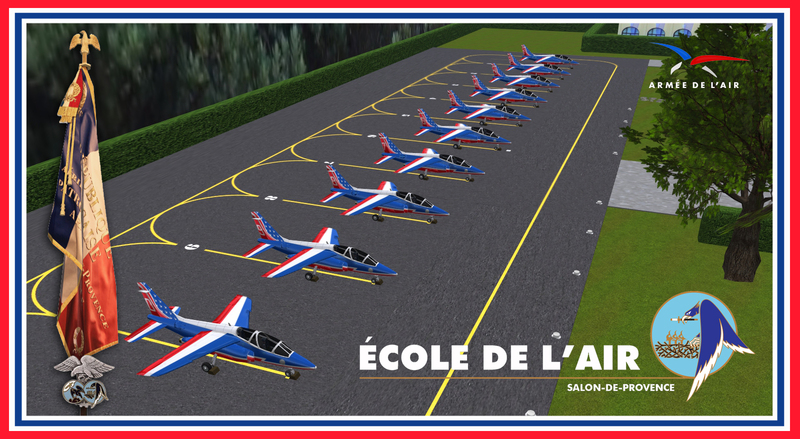 BA 701 Salon-De-Provence. 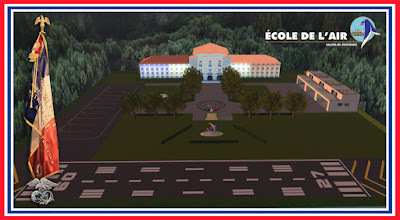 Tout-prés de Paris en SL! February, 2018. 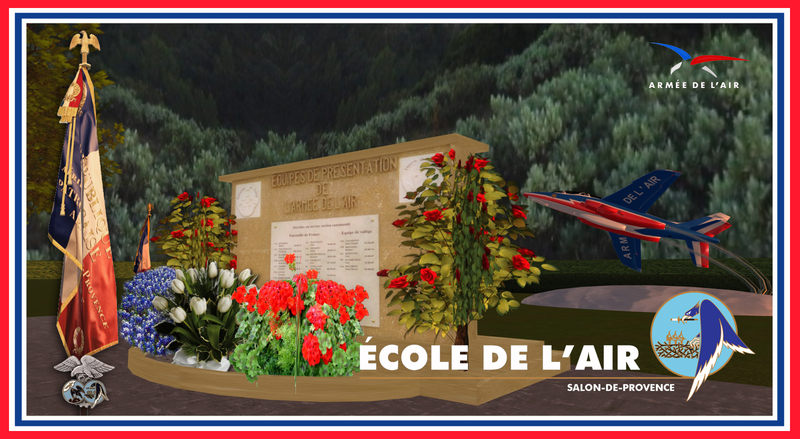 One of the older Alpha Jets on display by the EPAA fallen heroes monument. The Alphas lined up on the apron at the previous BA 701. August 2017. Close up of the EPAA memorial. Lest we forget. Full line up at Salon during the 2017 American Tour season! Things of beauty. One of GE 314 Alphas captured during the Daystar International Air Show 2017. A PAF Alpha Jet in the maintenance hangar at Gordon's. 01/30/2018. CAPT. Asra Kron and Lcl. Paterne Lefavre at Gordon's. 01/30/2018. A rare moment and honor. Cougar with all the squadron at Gordon's. 02/15/2018. 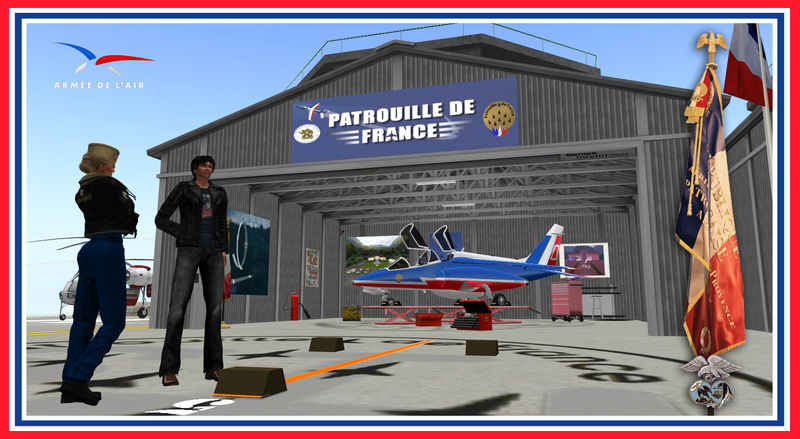 I was privileged to be invited to a rare occasion (documented above) at Gordon's, where the Patrouille de France en SL has their open skies base. On February 15, the squadron assembled there for the official team photo and I had the honor to take a photo with them during the session. A once in a lifetime moment. On that photo, from left to right, Lt. Chipoune, Cne. 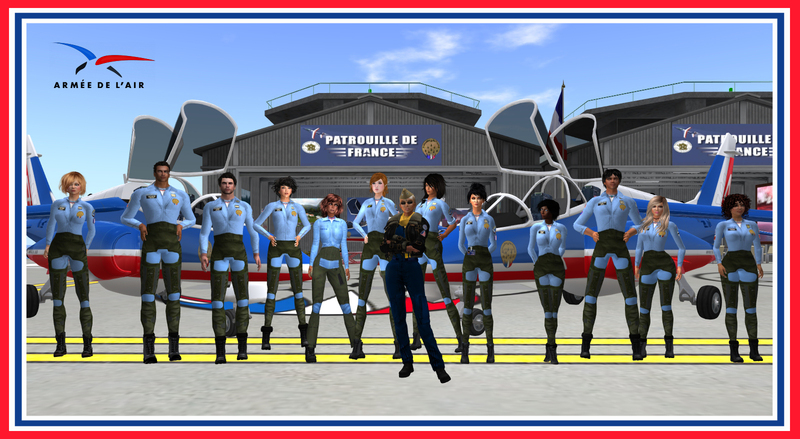 Patoulou, Lt. Tidus, Lt. Ariel, Lt. Jeremie Hottaling (Jenny), Col. Rhea Thor, yours truly "Cougar", Cdt. Aethalia Malies, Lcl. Mara Klaber, Cne. T'Sar Kanto, Lcl. Paterne Lefavre, Cdt. Gwenblonde and Cdt. Myrisse Loon. Oh happy day! To all my friends at BA 701 best wishes for the 2018 Season. We will meet in the great blue sky and under it as well. Merci bien, de tout mon coeur! To BA 701 Salon-De-Provence - SLUR here! To Gordon Regional Airport - SLUR here! An illustrated guide to new squadrons assigned to the United States Marine Corps detachment in Third Fleet. 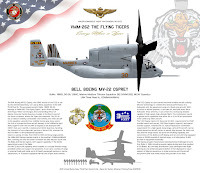 VMM-262 The Flying Tigers, equipped with MV-22 Ospreys, and HMH-466 Wolfpack operating the MH-90 MHF (NH Industries NH-90), both stationed at MCAF Quantico, the marines air facility that together with MCB Quantico will be inaugurated next March. It's a very exciting time in Third Fleet as we receive news that marines that served in SL before are turning to Quantico as a valid option to rejoin the Corps. We will welcome them into the fold and provide the support they require to once again represent proudly the real life naval institution that is the United States Marine Corps. The same standards that govern Third Fleet apply to the 5th Marine Division, and we have a very capable officer in charge of this Third Fleet detachment, base and air facility. The options on the table are for the moment rotary wing, tiltrotor and heavy transport and cargo. 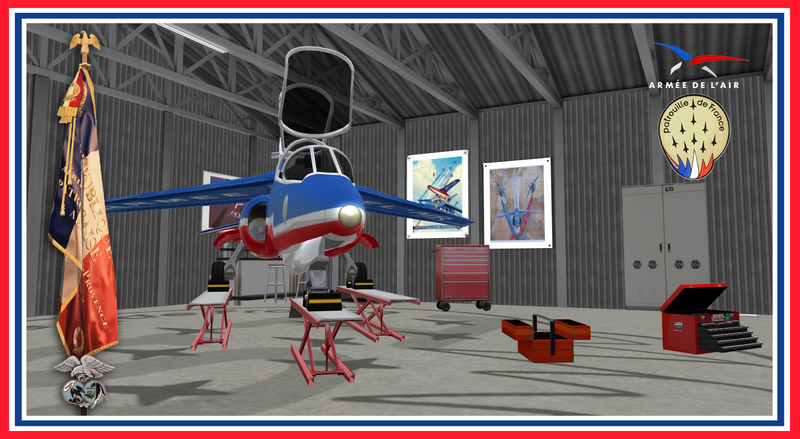 Together with VMM-262 The Flying Tigers and HMH-466 Wolfpack, Quantico will mirror real life and become the home of HMX-1 The Nighthawks (Marine One) with MV-22's, and NAS Miramar will provide support for VMGR-152 Sumos, a KC-130/C-130T Hercules unit, and last but not least, Fat Albert Airlines, that is part of the Blue Angels demo squadron, flying a very special C-130T. More details on the remaining squadrons soon, along with a preview of MCBQ / MCAFQ. Stay tuned. NH Industries MH-90 MFH Block 18 NH, DD-80, BuNo 18003, from HMH-466, Wolfpack, stationed at MCAF Quantico. The 80 was the first MH-90 MFH delivered to MCAFQ and is flown by USMC Major Dominique “Alba” van Dongen. This model provides the Wolfpack with a wide range of operational options in the North Satori, South Nautilus area where Quantico is located but also enhances Third Fleet capabilities in the PATROU role in Tuarua Fiji, and provides CSAR in southern COMNAVAIRNAU. The MH-90 size, range and workload makes the NH 90 an ideal alternative for the heavy helicopter role in the Fleet. 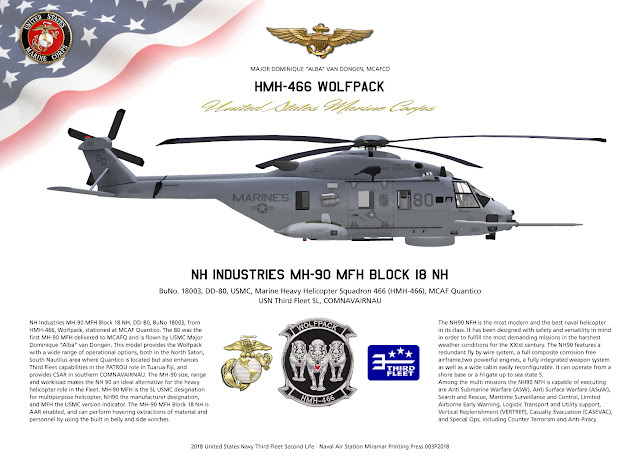 MH-90 MFH is the SL USMC designation for multipurpose helicopter, NH90 the manufacturer designation, and MFH the USMC version indicator. The MH-90 MFH Block 18 NH is AAR enabled, and can perform hovering extractions of material and personnel by using the built in belly and side winches. shore base or a Frigate up to sea state 5. The tricolor Falcons in their hangar at CinSal. Home of the T-Birds. 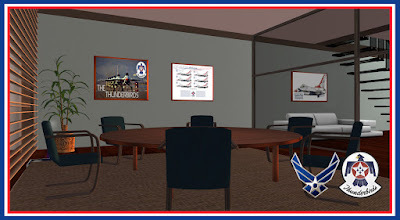 After a wrong foot start, the USAF Thunderbirds are back in Second Life with a more solid structure and a purposeful leadership that may in time lead to the establishment of the United States Air Force modern day counterpart in SL, but will certainly represent the Air Force from the get go in no uncertain terms. 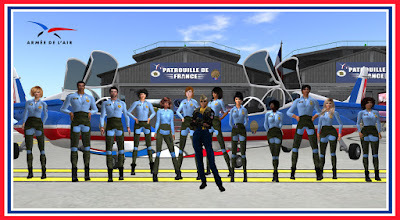 With a small base at CinSal International Airport, the T-Birds rise from the ashes under Lieutenant Colonel Volt Voltaire's command. I met Lt. Col. Voltaire at Honah Lee airport and we flew together to NAS Miramar after which we traveled to CinSal Airport in Agrippa - a place the Blue Angels hold close to their hearts - where T-Bird One gave Angel 7 a tour of the modest but solid and well placed base that is home to the Thunderbirds. Future interchange between the two American demo squadrons was one of the many topics covered. Below are a few mementos of the occasion (as usual, click on the images to enlarge). Cougar and Volt at Miramar after the flight from Honah Lee. 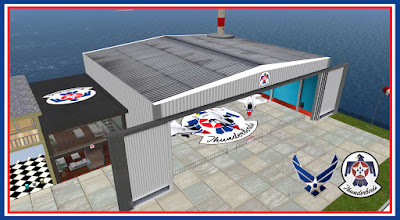 The T-Birds hangar and support building at CinSal Airport. Support building first floor meeting room and reception area. 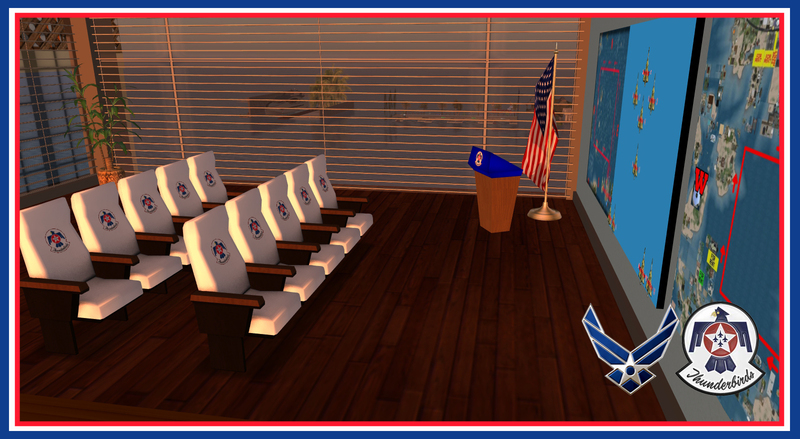 The Thunderbirds briefing room on the second floor. CAPT. 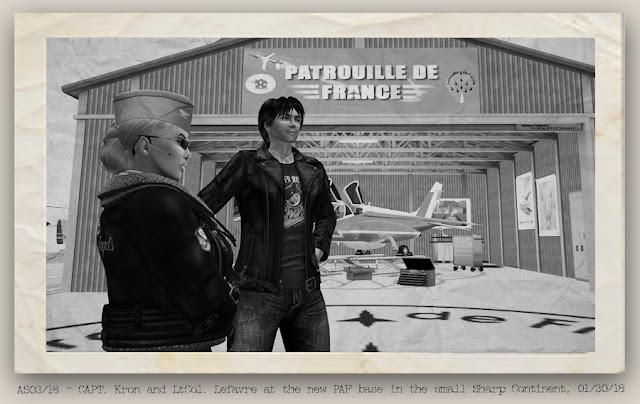 Asra Kron and Lt. Col. Volt Voltaire. The United States Navy Third Fleet in SL welcomes the Thunderbirds back to the Second Life aerobatic community and hope this squadron will become the corner stone of a modern age United States Air Force in SL. Best of luck, Lt. Col. Voltaire! 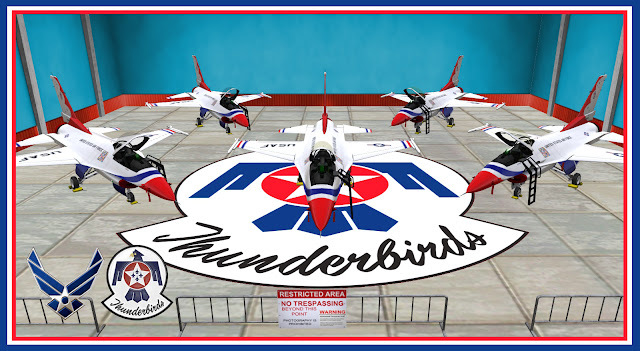 SLUR to the Thunderbirds new home - SLUR here! 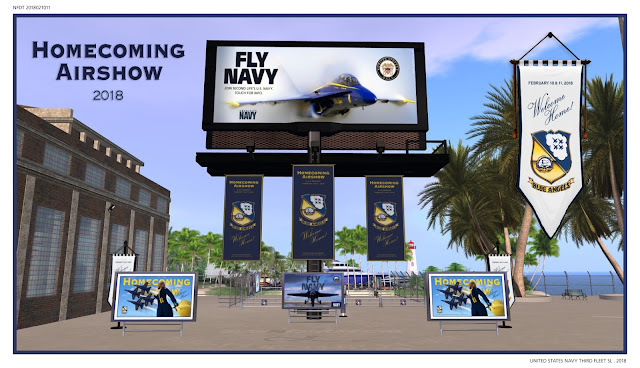 NAS Miramar main gate dressed up for Homecoming, February 10, 2018. 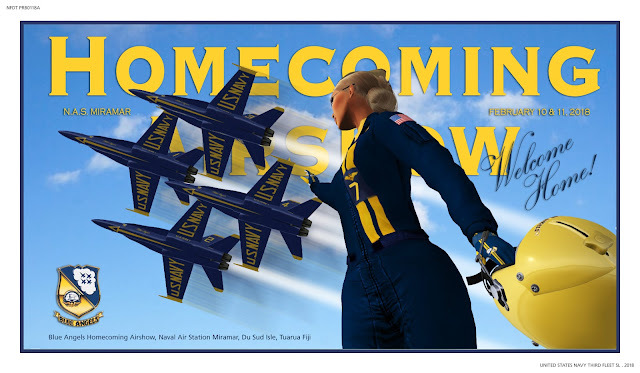 After two postponements, this year's Blue Angels Homecoming happened on the weekend of February 10 and 11, at NAS Miramar, traditionally marking the new season start for the Navy Flight Demonstration Team. This year, the Blues proudly flew their new F/A-18C Hornets for the first time, launching the first operational version of the upcoming Shana Carpool Aircraft commercial F/A-18C and F/A-18D Hornets. For two days and two demonstrations, the Blues introduced the 2018 team to their fellow officers, their families and friends and audiences from all over Second Life. Attendance was at the level of last year's edition ( see here ) and around 100 people were able to enjoy the air show throughout the two days. Day one team, from port side, BamBam, QB, Cougar, Hawk, Mistell and the Boss. We would like to express our heartfelt gratitude to all those who could be at Miramar to watch this annual event and thank you all for your amazing support. 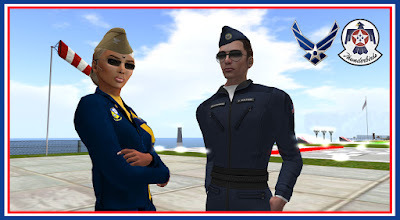 We fly the skies of SL to bring awareness to not just the United States Navy but also aviation in general, and the audiences that follow us each year makes our job, indeed, the best in the world. Thank you so much. The Blue Angels 2018 Season is officially open and what a year we have in store for you! 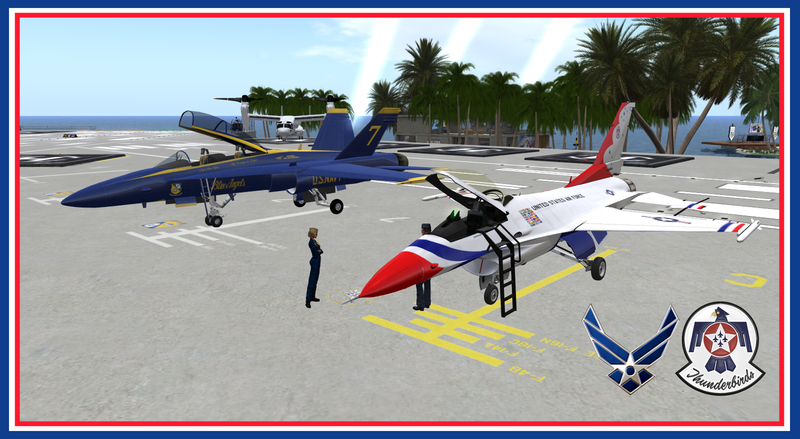 More news to follow and the invitation was made at Miramar at the end of Day Two and is repeated here now for the second air show of the year at Luxor International Airport, one of the Blues favorite demo locations, in March. Details soon. 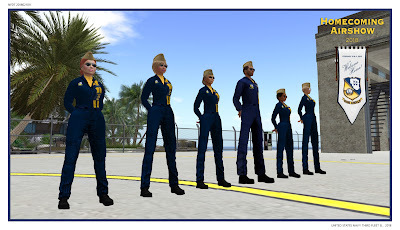 A special shout out to LT. Hazel "Witch" Brook and canine reporter extraordinaire Quin Avery for helping us relay the Blue Angels radio communications to part of the audience on Day One, our Third Fleet officers who served as ground crew on Day Two, and General Luke Flywalker, who recorded Day One on video. 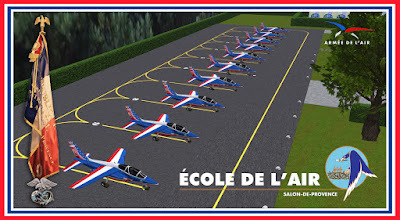 Watch the video on the SL Aviation Network channel - right here! Please follow the link on the icon above to see the complete photo coverage of the two day Blue Angels Homecoming Air Show of 2018. The photo coverage page will be accessible always from the right column of this weblog and now also in the February issue of the NEPTUNE magazine! The Bell Boeing MV-22 Osprey, the USMC version of the V-22 in use by the United States Navy, is in use by three squadrons in the USN Third Fleet SL. The portrayed aircraft, BuNo. 18005, DD-30, belongs to VMM-262 “The Flying Tigers”, and is flown by Major Dominique “Alba” van Dongen, the commanding officer of Marine Corps Air Facility Quantico, located in the North coast of the Satori continent, where the Tigers are stationed. The DD-30 has a medium visibility commander color scheme, the other aircraft in the squadron using the low visibility marine gray livery, and is the first of a projected three aircraft delivery to be fulfilled until April 2018, together with the two MV-22 Ospreys to be deployed with HMX-1 that, as in real life, is stationed at MCAF Quantico, handling the transport of very important persons in Second Life, whereas the real life HMX-1 is the presidential squadron. Used in a variety of roles, from CSAR to COD and long range patrols, the VMM-262 Ospreys operate mainly in the southern COMNAVAIRNAU area, covering not only the Satori continent but also Nautilus South and the Blake and Islands regions, with support capability in the Nordic easternmost area of the Blake. The MV-22 has air-to-air refueling capability which enables it a virtually limitless range, provided tankers can support its operations. It can carry a variety of cargo or external loads and inside up to 20 heavily equipped marines or marine parachutists, or 10 assault equipped marines and a light attack vehicle. The V-22 Osprey meets U.S. Navy and U.S.M.C. requirements for CSAR (combat search and rescue), COD (fleet logistics support), and special warfare support, matches the U.S. Special Operations Command’s requirement for a high-speed, long-range, vertical lift aircraft, can be stored aboard an aircraft carrier or assault ship because the rotors can fold and the wings rotate, has air-to-air refueling capability, the cornerstone of the ability to self-deploy and can carry 24 fully equipped troops or 20,000 pounds of internal cargo, or in alternative 15,000 pounds of equipment externally. The Osprey program faced several developmental challenges since its first flight in 1989, including several crashes during tests that resulted in 30 deaths. But the Navy and Marine Corps developed new flight techniques and enhanced systems before it first deployed to Iraq in support of Marine operations in Anbar province and the aircraft has proven safer than many rotary-wing aircraft in the fleet. The Blue Angels Homecoming Air Show takes place this weekend, February 10 and 11, at Naval Air Station Miramar. As usual there will be a small VIP area at Miramar but the audience will be split between three locations: bleachers on the NW shore of Deder Isle, the region East of Miramar, and seats on two USN frigates, the USS Defiant and the USS Dauntless, on the Aldabra Sea. The Blue Angels will be inaugurating the 2018 Season with the new F/A-18C Hornets and to mark the occasion a stock version of the Hornet will be raffled on site during the Homecoming weekend (see here). 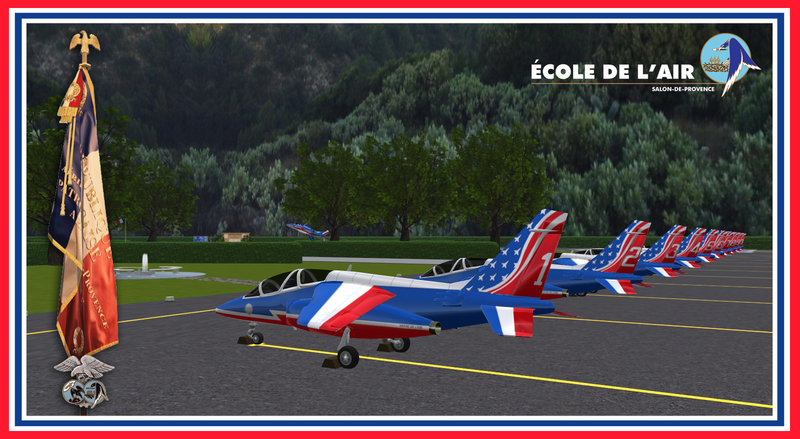 - Please do not fly to Miramar - the station is closed to air traffic during local air shows. - Please arrive early. Local officers will assist you and guide you to the best seats available. - Please be mindful of your scripts! There are script counters in place to help you reduce script usage. - Please remain in your seat and watch the show using your camera. - Please use one of the three locations available to spectators. Local officers will provide LMs. 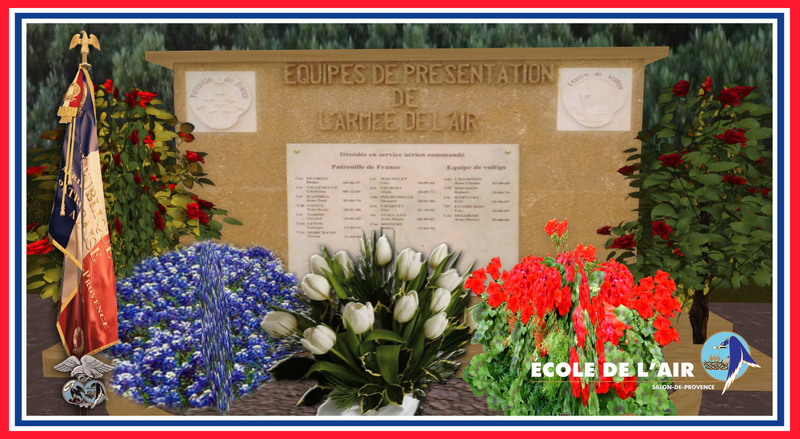 - Miramar (Du Sud Isle) is a Homestead, so restricted to general public during air show time. - If you choose to sail to the Aldabra Sea demo area please remain outside the audience sims. Deder Isle - Capri island bleachers - 15 seats - SLUR here! USS Defiant - Port Gonn, Northeast of Miramar - 13 seats plus - SLUR here! USS Dauntless - Conwy, North of Miramar - 13 seats plus - SLUR here! N.A.S. Miramar - VIP seats by Building A. - 7 seats - Reserved - SLUR here! Center point on Conwy with exit to Port Gonnonertnert. Blue Angels 1 to 4 start from 36 L and 36 R in finger four formation, half squirrel cage maneuver to diamond formation on take off followed by a half Cuban eight between Rafeiraga and Conwy. Blue Angels 5 and 6 start from 32 for a split take off, lead solo performs a dirty roll on take off while the opposing solo goes vertical and performs a split S.
Coming from the West in diamond formation the four aircraft will perform a wide circle over center point, completing 360 degrees. Coming from opposing regions, West and East, the two solos will meet at center point and execute a 360 degree roll as they fly by each other. Individual aileron roll in formation. Coming from the west, the four aircraft execute a 360 degree roll in the diamond formation as they fly over center point. Coming from the west, the two solos execute a side by side slow speed pass virtually standing their aircraft on their tails. Coming from the West in dirty configuration, gear, flaps and hook down, the diamond executes a loop on center point. Coming from the West, the solos execute a dirty configuration pass over center point with the lead solo inverted, mirroring the opposing solo flying under. Coming from the West, the diamond enters center point and Angels 1 and 4 roll 180 degrees to remain inverted in formation during the pass and into the next region East where they roll another 180 degrees to assume their normal position. Coming from the North, the two solos roll together 270 degrees on their axis over center point, crossing with minimum separation. Coming from the West in echelon four formation the four aircraft execute a parade pass over center point. Coming from the West the two solos execute a high speed aileron roll over center point. The solos join with the other four aircraft for an echelon six formation parade pass over center point, coming from the West. Coming from the West, the six planes execute a parade pass in delta formation over center point. Coming from the North, the delta breaks into a starburst over center point and reforms to the East. Coming from the West, the six planes break at intervals from the delta formation past center point, to travel North, then West and then South to land in a spaced single file, performing a carrier break landing.